Police For Trendsetters who love to break the rules! 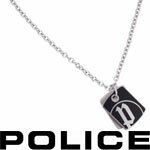 Since its introduction of the design brand Police in the market it has become an absolute wanna to have in Italy. With Hollywood celebrities like George Clooney, Bruce Willis and David Beckham, and not to forget the style icon Antonio Banderas, wearing Police jewelry has become a worldwide cult. It revolves around a brand with its own lifestyle and the right fashion look.